South Korea’s financial authorities are hastening to build a legal framework for the fast-growing peer-to-peer lending market, seeking to encourage investment by raising the ceiling while enhancing protective measures for investors, officials said Monday. 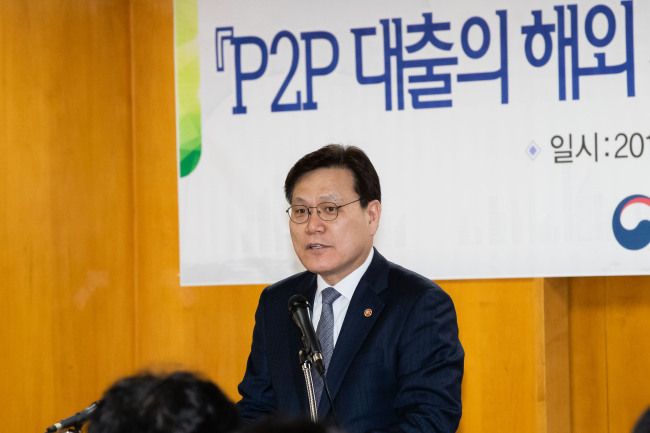 The Financial Services Commission, the Financial Supervisory Service and the Korea Institute of Finance jointly held a public hearing at the Korea Federation of Banks, inviting industry officials and scholars to lay the groundwork for a P2P regulatory bill. The occasion reflected the financial authorities’ earlier consensus that it was necessary to dedicate a bill exclusively to regulating the sector, instead of merely tweaking the rules on conventional lending. P2P lending has seen drastic growth in recent years, with accumulated lending in that sector soaring to 4.8 trillion won ($4.3 billion) as of the end of last year, from just 600 billion won two years earlier. The number of individual investors also surpassed the 250,000 mark. While viewing this fintech business model as a potential growth engine for the stalled financial market, market supervisors have increasingly expressed concerns about the lack of regulations. The FSC earlier released a set of administrative guidelines, saying lenders should issue more public notices, but the guidelines were not legally binding. “P2P finance has now settled as a key sector of fintech, so it is now time to legislate a bill that may systematically protect investors and borrowers,” said FSC Chairman Choi Jong-ku at the hearing. There are currently five legislative bills pending at the National Assembly that address P2P regulations -- three represent proposals for new legislation and two would revise existing legislation. The ongoing legislative discussions will deal only with the new drafts and exclude the revision bills, according to Choi. “The Financial Investment Services and Capital Markets Act offers limited protection for lenders, while the Act of Registration of Credit Business and Protection of Finance Users tends to overlook investors,” FSC officials added, calling for an exclusive P2P regulatory bill. The government’s current draft suggests that the minimum capital of a P2P lender be raised to 1 billion won, higher than the requirement for a stock-type crowdfunding broker. “As P2P lenders broker both investors and borrowers, they should be liable for greater responsibility,” officials explained. Also, authorities are seeking to reinforce the advertising regulations for P2P lenders to prevent them from exaggerating the benefits of their services and obligating them to warn investors of the risks.